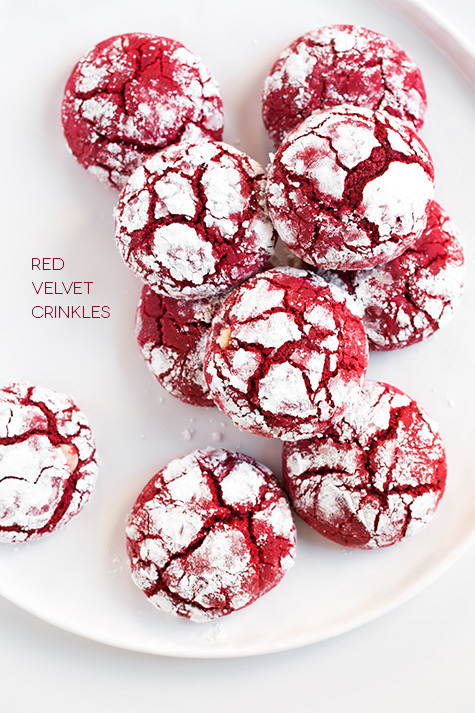 Red Velvet Crinkles – You're Off the List! I decided to give these crinkles a try because of a work pot luck. Most of my colleagues were Red Velvet crazy, so I wanted to introduce something new to them. Now, what is a Crinkle cookie? Simply put, it’s a cookie with small wrinkles and creases on the surface. So unfortunately this was also a recipe tested during the holidays, so I didn’t get a chance to take pictures. I would say that my crinkles turned out 80-90% like the pictures on the site. In a mixing bowl whisk together flour, cocoa powder, baking powder, baking soda and salt for 30 seconds, set aside. In the bowl of an electric stand mixer fitted with the paddle attachment, whip butter and granulated sugar until pale and fluffy. Mix in eggs 1 at a time, blending until combined after each addition. Mix in milk, vanilla bean paste, lemon juice and red food coloring. With mixer set on low speed, slowly add in dry ingredients and mix just until combined. Stir in white chocolate chips. Cover bowl with plastic wrap and chill 2 hours or until firm enough to shape into balls. *If you want them a little more chocolatey you can replace 2 – 3 Tbsp of the flour with 2 – 3 additional Tbsp of cocoa powder. In terms of the directions, it is very detailed. I only did 1 thing different =>made the dough ahead. After I chilled the dough for about 1/2 hour in the fridge, I formed them into balls (didn’t need to butter my hands as I used a cookie scoop to scoop out the batter). I put the balls in plastic wrap, inside an air tight box, then into the freezer. I made this 3 days ahead so that I can do fresh baked cookies the morning I needed them. Yes, it was very easy to make these cookies. I didn’t find any of the directions unclear. The only thing I would note for the direction is, when rolling the dough balls in the powdered sugar, make sure that it’s coated white and not a thin layer. I made several batches of these, seeing how easy and pretty they are, but the first batch, I was worried about rolling too much sugar, but when I rolled and dusted off the excess, they did not turn out pretty. Overall, I’d say the recipe turned out as it should. I got a thin crispy layer outside, soft, cake like inside. The white chocolate chips went well with the cookie, but I wonder what would happen if there were cream cheese chips? In terms of time, it wasn’t time consuming at all. I guess I did do make mine ahead of time. The dough freezes well and makes it’s very easy. Take them out of the freezer, roll in powdered sugar, and bake. If you choose to use this method, just remember to take the frozen dough out of the freezer and let it rest for about 1/2hr in room temperature before rolling them. If you were to follow the recipe, you would have that 2 hr gap of waiting for the dough to harden as it chills in the fridge, but if you’re making dinner in between, it would be perfect as well. These pretty cookies were super popular over the holidays. I guess with the red and white colour, it added to the festive feeling. My hubby, who generally doesn’t like sweets too much, had a few of these cookies. Everyone else really liked how they were almost like little cakes and with Red Velvet being a huge trend still, it increased the popularity of these crinkles. I ended up making 4 batches of these over the month and they were always gobbled up. Cooking Classy’s (on Yummly) Red Velvet Crinkles, you’re YOL Approved!